Be an amazing host this new years eve! West Elm teaches us How To Bar Tend Like a Boss! Surrounding yourself with a healthy environment is important in building a foundation for living green. Just like it is important for an artist or a writer to live in a creative environment, your surroundings shape your life. Green Goods Products is a great place to start. 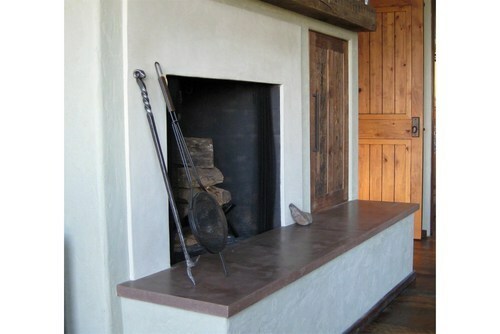 We provide flooring and countertops that use natural, rapidly renewable, and sustainably harvested materials. Additionally, a lot of our products contain no added formaldehyde adhesives that contribute to healthy indoor air quality. There are many other ways to make your home more sustainable including energy saving appliances, alternative energy sources such as solar, rainwater harvesting and grey water systemsand of course LED lighting. If you are considering new construction, please consider an architect that implements passive solar and/or strawbale construction. Combined your home will be immensely efficient in conserving energy. The next step is to implement sustainability into your diet. How does one go about that? A great place to start is by finding out what plants can thrive in your climate and start a small garden with basics such as tomatoes, and herbs. Don’t be discouraged if you live in an urban area. There are a lot of creative ways to have an urban garden! What you can’t grow, look for at your local farmers market. Farmers markets are a great way to guarantee your produce is grown locally. The further your food has to travel to get to you, the less your carbon footprint will be. Anything else you should be able to purchase at a natural or organic food market in your area. One of our favorites is Whole Foods! The more meals you cook at home the better. Besides being able to eat as a family, the benefits are that you know exactly what you are putting into your body. One of the biggest health mistakes we makes is that we don’t set aside time to make a meal plan. We end up doing what’s convenient and unfortunately that’s when you start making poor food choices. When you do decide to eat out, local non-chain restaurants are definitely a better choice than fast food! Especially if they promote organic and healthy eating. Supporting small businesses for other products and services is also beneficial to for sustainability in the local economy. Whether it be a boutique clothing store, a mom and pops hardware store, or a local flower shop, know that by choosing them over large corporations you are supporting equal business opportunity. Of course, many people have plans to travel this upcoming year! Travel is such an amazing thing and here at Green Goods we are huge proponents of it. It helps you gain a new perspective and in a lot of cases it allows you to be thankful for everything you DO have. When you’re traveling, implement the same habits as you do in your everyday sustainable living. Wherever you go you should immerse yourself in the culture and you should do that by supporting the local economy. Make sure you are striving to leave it better than when you found it. This doesn’t mean forcing your beliefs on someone else. This means being respectful of THEIR environment by cleaning up after yourself and consider water and energy consumption along your travels. I find that when I am on vacation it is easy to get lazy and do what’s convenient. Hey I’m relaxing can you blame me? The longer you live sustainably, the easier it is. Set daily reminders when you are first starting out. I try to spend time outside every day. Being close to nature is my daily reminder of how much I want the places I love to still be there for the next generation. Hiking, kayaking, or simply taking a walk around your neighborhood can mean all the difference in you daily efforts. This is our New Years Resolution. We hope you’ll join us this year! Hiking in AZ North Mountain! What a neat capture of this beautiful house with the reflection in the water! The idea for Squak Mountain Stone was derived from an essay assignment the owner Ameé Quiriconi wrote for an economics class during her Master’s program. Based on author Michael Shuman’s book Going Local, the idea was to have the students develop a product or service that would benefit their local economy. Quiriconi turned her idea into reality with Squak Mountain. Today, she makes handmade Squak Mountain Stone Countertops out of a small shop in Seattle. We love that there are movers and shakers out there willing to take a leap of faith on an innovative and socially responsible idea. 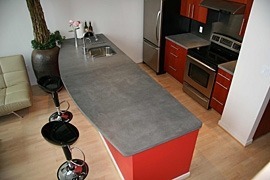 The countertops are developed from cement and post consumer recycled paper base. The material can be used not only as countertops, but also as benches, tabletops, hearths, stairways, and signs in a variety of commercial and residential applications. The appeal is in the hand-made nature, its pastoral, honest aesthetic and the sculptural variability that makes each slab distinct. It won’t look seamless and it most certainly will not look like it came from a cookie-cutter factory. Squak is the “rebel” in the countertop world. The post-consumer recycled content is 2.5%. The post-industrial recycled content is at least 49%. The entire product contains less than 1% crystalline silica. Hi Hanna here from Green Goods Products, your online shopping source for Green and Eco-friendly building materials. While visiting home for the holidays I’m taking advantage of Arizona’s great hiking trails including Pyramid, which is a part of the South Mountain National Park! Here at Green Goods we encourage you to live sustainably in every aspect of your life. Hiking is a great way to get out and enjoy some sunshine and nature! Flooring Design Inspiration Using one of our favorite products Marmoleum Natural Linoleum! Just some visual bliss from a recent paddle board outing in Pirates Cove! Beach Vibes at this recent living room update using Green Materials throughout! UCL Presidio Clear Steel Drum in Custom Rug in Polyester!